What exactly is wrong with this circus? There are demonic, flesh-eating clowns, murderous midgets, there is a fat lady with some peculiar tastes (to put it mildly) and there is an old man with one hell of a secret. Old Pa keeps a trunk with some very special souvenirs. When a stranger joins up who has second sight (among other talents) the old man’s son gets nervous. If that isn’t enough, there are a lot of very strange beings not to mention a succubus or two and some beings from hell! I must first point out, that horror is not generally a genre I read, but this book really was very good and the storyline was such that it kept me engrossed from beginning to end. Ms. Gill has created a veritable entourage of weird, wonderful and creepy characters, and the story centers around a man who is trying to protect his father, but as we discover, he has some hidden secrets of his own. Despite the utter depravity shown by the vast majority of the characters, I have to say that I found most of them to be quite likable (which surprised me immensely, believe me!). Ms. Gill has taken the sideshows and circuses of the depression era and reinvented them in such a warped and fascinating manner, I found myself unwilling to stop reading until I reached the conclusion. She has perfectly captured the sounds, sensations and shtick of the era, when it was acceptable to gawk at those who were different, in any way shape or form. No political correctness was required when you visited the sideshows and these flawed, abused and tragic characters come together in Circus of Horrors in such a way, as to have you genuinely interested in their lives and situations – and as the story unfolds, you just know things are going to go downhill, and fast. 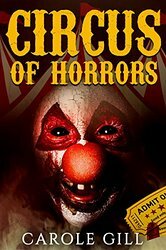 Circus of Horrors is not for the fainthearted, and there are numerous obscenities throughout the book, but Ms. Gill has neatly tied her story into a macabre little bow, and if you are a lover of horror, I highly recommend it.